It is Wilfrid Laurier University’s raison d'être — and it can be seen in the widespread commitment among students, staff, faculty and alumni who are working to make a difference in the lives of others. It is also reflected in Laurier’s Ashoka Changemaker status, a prestigious designation bestowed upon the university in March 2016 by Ashoka U in recognition of Laurier’s strong culture of and commitment to promoting and facilitating social enterprises, entrepreneurship and innovation. This past March, a delegation from Laurier attended the Ashoka U Exchange gathering for the university’s official welcome as a Changemaker Campus. Ashoka is a respected international association dedicated to the belief that individuals and organizations can be true “changemakers” — agents for creating positive social change in the world. Ashoka U is a global network within Ashoka that strives to foster a culture of social innovation in higher education. “When we started to explore what Ashoka U was all about, nearly two years before we received the designation, we found a lot of synergy with Laurier activities — it aligned really well with our reputation and the activities taking place across our academic communities,” says Benham Rennick. She points to several examples — faculty members like Steve Sider and Bree Akesson who are combining research and purposeful course activities to empower communities, and programs such as RECODE and LaunchPad that are fostering the success of traditional business and social enterprise innovators — as activities that align with being named a Changemaker Campus. Since receiving the Ashoka designation, Laurier has better organized, improved and concentrated opportunities and resources for social entrepreneurship and social innovation through the university’s Schlegel Centre for Entrepreneurship and Social Innovation — one of Canada’s longest-running postsecondary centres dedicated to entrepreneurship education. In fact, those activities are so significant they have recently been recognized through the Association to Advance Collegiate Schools of Business (AACSB) Spotlight on Entrepreneurship. “The social innovation and entrepreneurial mindset is widespread at Laurier and the Schlegel Centre helps bring it all together alongside traditional business models,” says Benham Rennick. In 2014, a substantial grant from the J.W. McConnell Family Foundation’s RECODE program, which aims to transform higher education by supporting a national network of students and institutions committed to social innovation and social entrepreneurship, helped Laurier work toward the Changemaker Campus designation. Since its launch, SIVC has been facilitating and supporting different types of social innovations and social enterprises. In January, Laurier launched Start@SIVC, which offers non-traditional approaches to entrepreneurship training. 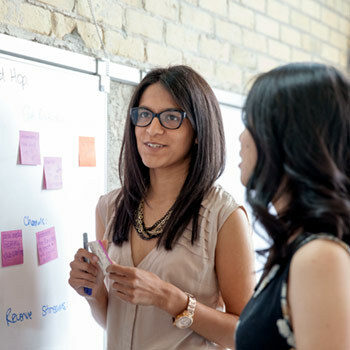 At Laurier’s Waterloo campus, the program is designed to meet the needs of female social entrepreneurs. At Laurier’s Brantford campus, the program is targeted towards individuals with no previous business training or little-to-no post-secondary education. The RECODE discussions also led to creating the Purpose Lab on Laurier’s Waterloo campus and the Community Innovation Hub in Brantford, both of which were generously supported by Laurier alumni. Made possible with funding from the Wilfrid Laurier University Alumni Association (WLUAA) and the Student Life Levy Fund, the Purpose Lab is a student-operated social innovation zone that encourages interdisciplinary collaboration about complex global challenges. The Community Innovation Hub, also made possible through WLUAA, provides students, staff, faculty, alumni and Brantford community members with a collaborative space to facilitate social innovation and entrepreneurship activities. The activities are as diverse as reducing food waste, improving transportation, and engaging new settlers in our communities. CityStudio Waterloo is another significant Laurier project launched since receiving the Changemaker Campus designation. “The idea behind CityStudio Waterloo is connecting Laurier students with local government to help think about and respond in an innovative way to critical issues in the community,” says Benham Rennick. Inspired by CityStudio in Vancouver, CityStudio Waterloo is located in the historic Carnegie Library on Albert Street. The project offers city staff and students the opportunity to engage, support and advance the goals and objectives of the City of Waterloo’s Corporate Strategic Plan. Assistant Professor John Abraham from Laurier’s Global Studies Department in the Faculty of Arts deliver the academic programming in CityStudio. LaunchPad, which is run by the Schlegel Centre, is Laurier’s business incubator program in Brantford and Waterloo designed to help people trying to start and scale up their businesses. It provides aspiring entrepreneurs with a business-supportive ecosystem that offers mentorship, access to resources like lawyers or accountants, and financial support. “The reality is that the Changemaker status really represents what Laurier already is and how Laurier has evolved,” says Benham Rennick.